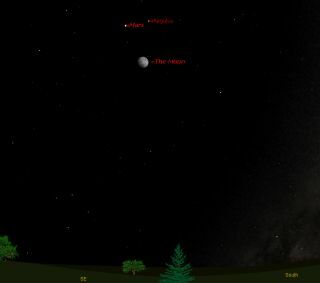 This sky map shows the location of Mars, the moon and the bright star Regulus at 9 p.m. ET on April 3, 2012 to observers at mid-northern latitudes. As the evening twilight deepens around 8:30 p.m. local time Tuesday night (April 3), check out the southeast sky. Weather permitting, a waxing gibbous moon will be shining bright, but it won't be alone. Situated well above the moon will be two bright "stars." I've placed the word stars in quote marks, because one of those stars is in reality a planet: the so-called Red Planet, Mars. The planet will form a cosmic triangle with the moon, Mars and bright star Regulus. The arrangement can be seen in the sky map of Mars accompanying this planet viewing guide. A month ago, Mars came to opposition with the sun and two days later arrived at its closest point to the Earth in 2012, a distance of 62.6 million miles (100.7 million kilometers). Since then, Mars has been receding from us and correspondingly has faded. On Tuesday, Mars will be 70.7 million miles (113.8 million km) away, but will still appear to shine brilliantly. Only the moon, Venus, Jupiter and the stars Sirius and Canopus rank higher in brightness. But Mars is now shining at about 70 percent of the radiance it had a month ago and its fade-down will become even more apparent in the coming weeks. One month from now, it will shine only about half as bright as it does now. And if you look carefully at Mars, you'll see that in spite of its popular "Red Planet" moniker, its true color leans closer toward yellow-orange. Both planet and star are separated by about 5 degrees, while the moon stands about 10 degrees beneath the pair. Your clenched fist held at arm’s length is approximately equal to 10 degrees in width. So we could say that the length of Tuesday's eye-catching triangular pattern (why not call it a Mars Triangle?) is roughly equal to "one fist." Currently, Mars is in the midst of describing an elongated loop against the stars of Leo. It is in its retrograde, or "backward," motion and appears to be traveling toward the west. As a consequence, Mars is edging closer toward Regulus, though this will come to an end in less than two weeks when this retrograde motion comes to an end and the planet resumes its normal eastward motion. While Mars is receding, it is still worth a look if you have a small telescope. In a high quality 6- or 8-inch telescope on a night of excellent seeing, you may make out the north polar cap, dark surface markings and occasional white clouds. Right now we are blessed to observe it high above the low-altitude hazes and poor seeing conditions that normally plague Northern Hemisphere observers. It will reach its highest point in the sky at around 10:30 p.m. local time, when it will be more than 60 degrees ("six fists") above the southern horizon. Mars is not the only bright object to watch for in the Tuesday night sky. The planet Venus will pass through the Pleiades star cluster in the western sky on the same night. If you snap an amazing photo of Mars, Venus and the Pleiades, or any other skywatching target, and would like to share it for a possible story or image gallery, please contact SPACE.com managing editor Tariq Malik at tmalik@space.com.